We as a culture love bad movies. Seriously: look how many have been lionized far beyond their relative level of quality. The best example I can come up with is the Rocky Horror Picture Show. Let’s be honest: it’s a lousy movie. However, it has an enduring life as an audience participation film, plus hordes of horny teens (mentally, if not physically) flocking to see it thinking they’re participating in a truly edgy sexual experience, and getting to say the word “virgin” over and over. Yeah. Anyway, where Rocky Horror really took off was when the audience started to shout lines back at the screen in answer to lines of dialogue. People started dressing up as their favorite characters from the film (arguably also starting the Cosplay movement in the US) and act out scenes from the film in pantomime. In the late 1980s/early 1990s, I was in Minneapolis staying with some friends when I was introduced to Mystery Science Theater 3000. 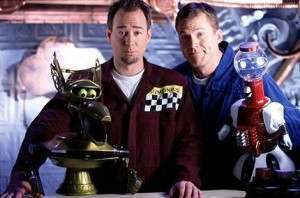 Locally produced, it starred Joel Hodgson and the voices of Kevin Murphy and Trace Beaulieu as his sarcastic robot/puppet pals, Tom Servo and Crow T. Robot. The premise was that Joel was trapped in a satellite, and the evil scientists who had fired him into orbit (played by Trace Beaulieu and Frank Conniff) would beam a different bad film up to him every week and monitor his mind as part of some experiment. Joel and the ‘bots would crack wise and insert their own dialogue, resulting in amusing — and often hilarious — results. MST3K ran for 11 years and well over 200 episodes, and was syndicated on both Comedy Central and the SyFy channel. The image of the silhouettes of Joel (later Mike Nelson) and the bots superimposed against the bottom of the screen where the film they were commenting on was running is iconic today, and a well-known pop-culture icon. Its popularity is such that a Kickstarter campaign was held to re-launch the series — now in its third season — with new actors and writers and a new set of films to lampoon, and it raised $5.7 million dollars — nearly three times the campaign’s stated goal. I have a number of friends who are fanatics for bad films. They even go to bad film festivals in order to enjoy the awfulness on the big screen as Hollywood intended. While not quite that gung-ho, my wife and I attend live streams of RiffTrax, https://www.rifftrax.com/ one of the inheritors of the MST3K mantle, at our local theater once or twice a year. In fact, we have tickets to see the RiffTrax version of Octaman this very week; we’re looking forward to seeing what Bill Corbett, Mike Nelson, and Kevin Murphy can do with this one.